Ballet originated in the courts of France and Italy in the 16th century as an entertainment performed by aristocratic amateurs. Louis XIV was a fan and founded the first ballet school in 1661. The principles of the form remain much the same as they were then: the turned-out shape of the legs, the five positions of the feet and arms, the elegance and upright posture. Key steps include the arabesque (where the dancer stands on one leg with the other extended straight behind them), jeté (a travelling jump) and the pirouette (a turn on one leg). The oldest surviving ballets are the Romantic ballets of the 1830s/40s - Giselle, La Sylphide, Coppelia (1870) - which tend to be characterised by their supernatural themes and delicate, ethereal ballerinas, floating on air - or in fact, on pointe shoes. Next came the classical ballets of the late 1800s which heralded the golden age of Russian ballet - Sleeping Beauty, The Nutcracker, and the best-known ballet of all, Swan Lake, with its corps de ballet (the dancing chorus) of white tutu-clad swans. During the 20th century, ballet had one makeover after another. Russian impresario Serge Diaghilev started a revolution when he brought his Ballets Russes to Paris, unleashing the virtuosic talents of dancer Nijinsky, the radical choreography of Fokine and the riot-inducing music of Stravinsky. One of Diaghilev's dancers, Marie Rambert, founded Britain's first dance company in 1926. Another, Ninette de Valois, set up the Vic-Wells Ballet at the Old Vic and Sadler's Wells theatres in 1931, which went on to become the Royal Ballet. In New York, Diaghilev's most influential protégé, George Balanchine, developed a distinctive style for the New World - pared-down abstraction married with music, with streamlined dancers who sent their legs soaring sky high. In Britain it couldn't have been more different, as choreographer Frederick Ashton favoured soft arms, intricate footwork and lots of épaulment (a slight twist of the torso). 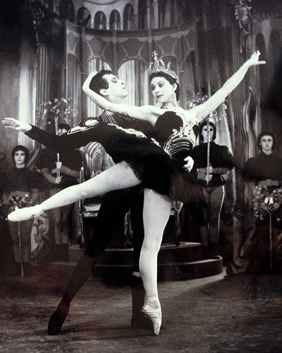 Ashton's successor Kenneth MacMillan preferred to delve into his characters' psyches and moved towards real-life subjects, although he also created a famous Romeo & Juliet for Margot Fonteyn and Rudolf Nureyev who were international superstars beyond the ballet world. In the 1980s American choreographer William Forsythe turned ballet on its head, deconstructing the classical idiom and pushing the dancer's technique to its limits. And while the old favourites are frequently performed and constantly reworked, young choreographers like Christopher Wheeldon continue to develop and stretch the language and build on ballet's foundations.